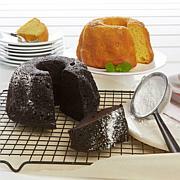 Enjoy this full flavor variety of delicious rum cakes. Baked in the Caribbean with a four-generations-old family recipe, they're the perfect way to entertain guests or take dessert-time up a notch. Contains or may contain wheat, eggs, milk, soy and nuts. Ingredients: Sugar, enriched bleached flour (wheat flour, niacin, reduced iron, thiamin mononitrate, riboflavin, folic acid), water, whole eggs, soybean oil, Non-fat dry milk, emulsifiers (Propylene glycol mix of mono and diglycerides), modified starches (potato, wheat, and corn) TORTUGA® Gold Rum, egg whites, salt, leavening agents (baking soda, sodium acid pyrophosphate, monocalcium phosphate, Dicalcium phosphate, sodium aluminum phosphate), texturizers (gum Arabic, xanthan gum, guar gum, sodium alginate), caramel color, artificial and natural flavors, sorbic acid (preservative), artificial color (FD&C Yellow #5). Characterizing ingredients natural and artifical flavoring present in less than 1% by weight. Contains less than half of 1% alcohol. Ingredients: Wheat flour, Unsalted Butter (Cream, Water, Milk Fat, non fat Milk Solids, Eggs, Water, Molasses, Sugar, Prunes, Raisins, Orange Peel, Spices: Leavening Agent (Baking Powder, Baking Soda, Mono-calcium Phosphate, Sodium Aluminium Sulphate), Caramel, Artificial & Natural flavoursTortuga Gold Rum. Contains less than ? % alcohol. Ingredients: Sugar, enriched bleached flour (wheat flour, niacin, reduced iron, thiamin mononitrate, riboflavin, folic acid), eggs, water, soybean oil, Non-fat dry milk, emulsifiers (Propylene glycol mix of mono and diglycerides), modified starches (potato, wheat, and corn) TORTUGA® Gold Rum, egg whites, salt, leavening agents (baking soda, sodium acid pyrophosphate, monocalcium phosphate, Dicalcium phosphate, sodium aluminum phosphate), texturizers (gum Arabic, xanthan gum, guar gum, sodium alginate), caramel color, artificial and natural flavors, sorbic acid (preservative), artificial color (FD&C Yellow #5). Contains less than half of 1% alcohol. Characterizing ingredient present in less than 1% by weight-Vanilla Extracted by Mexican Vanilla Beans. These cakes are fabulous. My families favorite has been the golden rum cakes. We have always found this one to be the moistest out of all the assorted flavors. 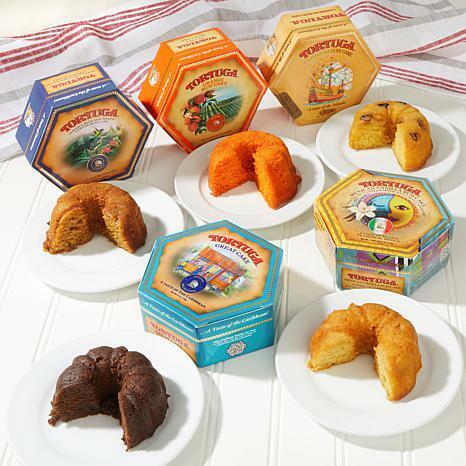 Thank you, Tortuga & to HSN! Incredibly tastefully flavorful and moist with every bite that you take. Vanilla taste is somewhat subtle but is blended beautifully with the rum. I have not tried the other flavors yet, but have no doubt they all will be just as flavorful. A supurb buy. You won't be disappointed. Moist and flavorful, great to have on hand. This item I would recommend, it not only tastes great, but was fresh and moist. 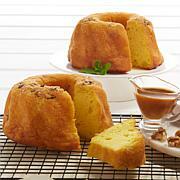 Tortuga Banana Rum Cake and Golden Rum Cake Experience some tropical flavor. 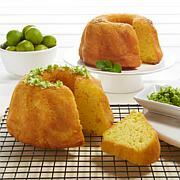 These moist, delicious cakes are baked fresh daily in the Cayman Islands with only the finest natural ingredients. One bite, and you're sitting on the beach with a fruity cocktail in your hand. Warm breeze sold separately.